Today, Lenovo announced a collaboration with Intel, PayPal and Synaptics to bring secure online payments to the personal computer with just the touch of a finger. 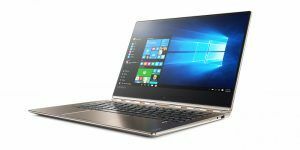 With the new Lenovo Yoga 910 featuring a 7th Gen Intel® Core™ processor, buyers making purchases from their PCs will have access to enterprise-grade security measures without the use of passwords. The solution is FIDO-compliant and leverages the built-in security features of 7th Gen Intel Core processors; hardware and design expertise of Lenovo; the encryption and biometric features of Synaptics’ fingerprint sensor; and the payment processing and unique authentication ecosystem of PayPal. Intel has been driving innovation to make the computing experience more simple and secure. This collaboration with Lenovo, PayPal and Synaptics is an example of that vision.